Musicnizer can download information about albums and artists from the internet. By default, information is downloaded from MusicBrainz, but other music services are also available. While the downloaded information is controlled by the "Download options" tab of the settings window, there are also individual options for the MusicBrainz script. We access them on the same tab where the active download script is selected. There are several options that specify how covers should be downloaded. Download album cover from Amazon. This tells Musicnizer to search for a cover at Amazon, if no cover was downloaded from MusicBrainz. Always download an album cover from Amazon (even if others were found). This option supplements the first one and forces Musicnizer to download covers from Amazon. Download pictures for the album from Discogs. Discogs is another popular music database, and Musicnizer has a separate script for it. 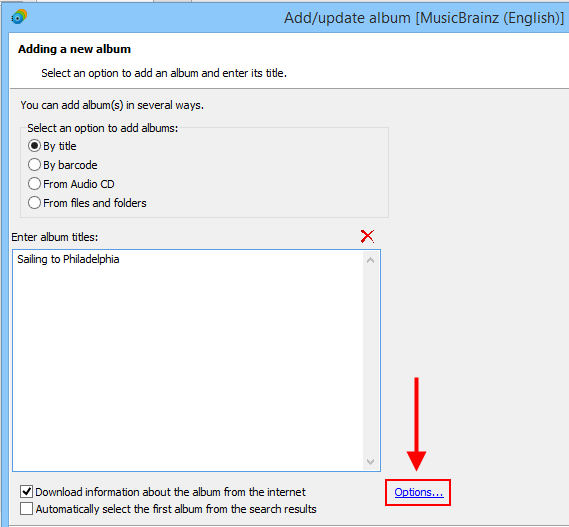 However, when you download information about albums from MusicBrainz, the script can automatically connect to Discogs and download images for the album (cover, back cover, etc.). Download album cover from ozon.ru. This option is mostly applicable to albums released by Russian artists. Musicnizer also downloads information about artists, such as discography, biography and photos. Scripts for artists are selected on the corresponding tab of the "Options" window. By default, MusicBrainz is used both for albums and for artists. 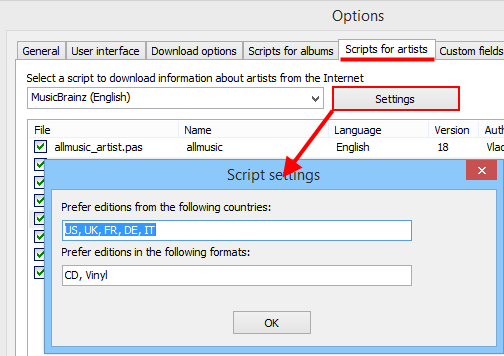 In fact, you can download information about albums and artists from different sources, but it is recommended to use the corresponding pair of scripts. Prefer editions from the following countries. MusicBrainz lists editions of an album from all over the world. When downloading discographies of artists, Musicnizer can prefer editions from certain countries. Using this field, you can specify your preferred countries in your preferred order (the first one is most important). Use the two-letter codes of countries and separate them with commas. Prefer editions in the following formats. Just like with countries, an album can be released on several types of carriers: CD, Vinyl, DVD-Audio, Cassette, etc. This fields allows specifying your preferences. Use the types available at MusicBrainz. These settings work for discographies of artists, they do not affect any search results in the "Add album" dialog.